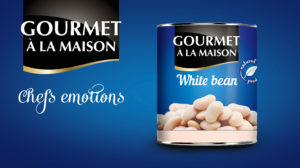 EU Foods presents You our new series of canned bean Gourmet ala Maison – Chefs emotions. You will find our big variety, all with perfect taste and texture. Made with love for your table. Perfect for every dish- from salats and starters to main. You can choose the opening of the can between Easy open or Regular open. Also between the Different sizes– 425 ml, 500 gr, 1 kg and 3kg.